Fort Neuro ends this prog with the soldiers snapping out of their mental funks all at once and fighting back against those dirty Norts. Hooray! The robots that helped Rogue Trooper, which, incidentally, thanks to artist Cam Kennedy look like remote control bomb disposal robots, are rebuilt with smiles drawn onto their faces. So, even the robots have a happy ending. Yippee! Reader John McCrea of Northern Ireland has his drawing of Judge Toyah published by Tharg. I know that McCrea goes on to produce work for both Crisis and The Megazine but I can’t remember if he becomes a bona-fide art droid. I guess The Slog will reveal all as it progresses. In real time, it’s 1983 and I’m dipping into 2000 AD now only slightly more often than I did during the 200s, which isn’t very much. I’m already a huge Alan Moore fan and, thanks to fanzines like Fantasy Advertiser, I’m able to track any work that he is producing for publications other than Warrior. I remember buying prog 308 because it features the first episode of the ET inspired, Skizz, but by this prog, I had moved on despite Moore’s appearance being guaranteed for the next few weeks. 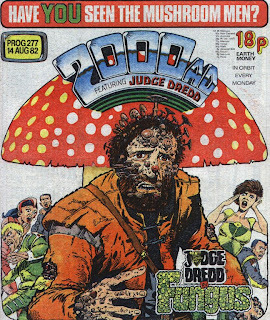 I was disappointed to see in prog 309 that Skizz had been dropped from six pages to four. I decided that I couldn’t rely upon him writing the Time Twisters every time and made the decision that the money I would spend on four weekly 2000 ADs (eighteen pence each, or twenty from next prog) would be better served going towards around three monthly American comics. There have been some enjoyable yet modest little Time Twisters before now, particularly those written by script robot Alan Hebden, but it’s Alan Moore’s tales which remain the most memorable. Perhaps this is because his are the only ones that get collected and remain in print. This prog features his first, called The Reversible Man, drawn by Slog favourite, Mike White. In The Reversible Man, a man lives his life backwards, starting with his death (or birth in this case) in the street and ending with his birth as a baby (or death). During the strip he sees his mother come back to life and every year he is demoted in his job. In the recent documentary about 2000 AD on Radio 4, a critic for The Guardian newspaper talks about how good this strip is, it being one story, four pages long out of the thousands upon thousands that 2000 AD has produced, pointing out that it predates Martin Amis’ booker prize short listed novel Time’s Arrow by years. (I haven’t read Time’s Arrow, incidentally. I understand that it’s a novel which is like a comic but without the pictures). The critic (whose name, I’m sorry to say, I can’t remember) talks about it being, in parts, strangely moving, particularly one scene, where the character is walking along with his wife. Unexpectedly, they spread their newspapers onto the train station platform, stand up, have the papers flutter up into their arms and then bump into each other. After that they go their separate ways and he never sees her again. For me, it was the end of the story which stayed with me the most. It finishes with the line, “The End. Well, not exactly the end. But...” First time around, I took this to mean that the character starts to live his life forward, but on re-reading it for The Slog, I interpreted this as his life continuing to run backwards in the womb up to a single sperm wriggling backwards out of the egg and, perhaps, beyond. When Play it Again Sam started, I was okay with the idea of an all singing, all dancing version of Robo-Hunter. This was because Sam Slade’s Brit-Cit adventures have been averaging around seven or eight episodes which isn’t very long in Slog time. My problem is that I’ve never really liked musicals and with Play it Again Sam now fifteen parts old with no end in site I have learned that I don’t have much patience for comic strip sing-alongs either. Sam has been hired by prime droid, Iron Aggie, to infiltrate The Human League (the anti-robot organisation, not the band) and flush out their leaders. Everything is going fine until Slade is duped into assassinating Iron Aggie herself. The fall-out sees all humans being rounded up and placed into concentration camps. In this prog’s episode, Hoagy, currently a camp guard (by which I mean he’s both a guard at the camp and slightly effeminate), who is stupid again after a few weeks of being annoyingly intelligent, is helping Slade and Kidd escape. The story, from John Wagner and Alan Grant, is, as you would expect, fun, the problem is how long it’s taking to get anywhere. 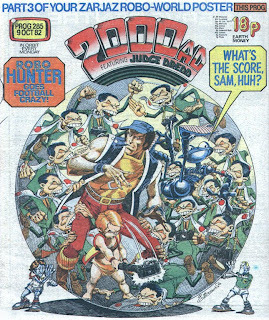 Robo-Hunter averages five pages an episode, and the songs average about two, making them an annoying distraction from the development of the plot whenever they start. I find myself resenting the tunes, despite how witty they might be, because they’re denying me full access to the characters I like. In fact, here’s a bit of advice for you if you’re a writer of modern mainstream superhero comics struggling for ways to pad out your stories; try writing some song and dance routines in. You can double, sometimes even triple your story’s length. Another problem with Play it Again Sam is I don’t always know the tune that I am expected to sing the song along to. Whenever characters break into song, there is a caption informing the reader “sung to the tune of such and such”. This is all very well if you know the tune of the song being referred to but this isn’t always the case with me. A musical comic strip seems to be a worthy experiment in theory but one that, on this occasion, hasn’t worked entirely. While the prisoners riot in one Gerry Finley-Day scripted thrill, Harry Twenty on the High Rock, Rogue Trooper continues his tour of Fort Neuro in the other. Fourteen episodes ago, Rogue decided, along with Helm, Gunner and Bagman, that they needed a break from their search for the traitor and the best holiday location that they could think of was a Souther fort under siege from the Norts. How they thought that this might be relaxing, I don’t know, unless of course, the only other available option was a First Choice package holiday. Rogue has been visiting different sectors of the fort and has learned that being under perpetual attack has sent everyone a little bit mad. In one section, the soldiers there have become obsessed with Napoleon and speak in fake French accents a la ‘Allo ‘Allo. In another, they’ve become obsessed with disco music resulting in the bizarre image of Rogue on the dance floor. So far, Fort Neuro reads like the Rogue Trooper equivalent of a Judge Dredd multi-part epic. Like typical Dredd sagas before, there has been a rotation of memorable artists including Colin Wilson (who, at one time, looked like he was being groomed as Dave Gibbons’ replacement as head artist on the strip) and Cam Kennedy (who, to my mind, is becoming the character’s definitive art robot). At the moment, it remains a modest thrill, still maintaining only four pages an episode on average, which is tiny when you consider that Rogue has been sniffing at Dredd’s heels in the Readers Polls for a while now. 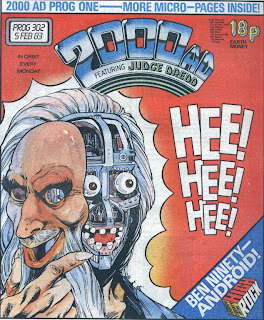 We are in the midst of 2000 AD’s golden age and part of the core group of script robots helping to set the tone of the comic at the moment is Gerry Finley-Day. I’ve wondered before, in regards to the history of the comic, if Finley-Day should be considered a writer closer to the same league that John Wagner, Alan Grant and Pat Mills are members of instead of being consigned to the lower divisions as he often seems to be. He might not have the same sense of satire as them and his work might be altogether more earnest but Rogue Trooper remains a major player, as important to the history of the weekly as Slaine, Nemesis the Warlock and Robo-Hunter. Previously when I blogged about Alan Davis drawing Harry Twenty on the High Rock, I talked as if the strip was being drawn for people into sadomasochism. 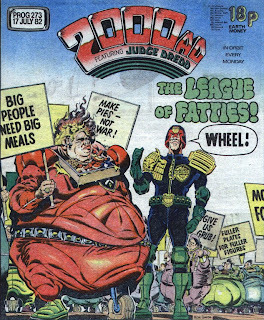 Elsewhere in 2000 AD, the Judge Dredd thrill is filled with bullies waving happy sticks around and wearing skin tight leather gear but I’ve never once implied that, for example, Carlos Ezquerra might be sexually predisposed to this sort of thing. The only reason I implied it about Davis on this occasion was for comic affect. In case you don’t know, The High Rock is a huge, diamond shaped prison which hangs in Earth’s orbit like an ugly, metal cancer. Harry has been sent there for something that he did do; the heinous crime of smuggling food to the starving. For the last year (this is in thrill time, not slog time), Harry, with the help of his cell mates Genghis Eighteen and old Ben Ninety, has been planning their escape and, recently, succeeded. But as soon as they reach Earth, Ben reveals himself to be an android infiltrator and a group of slugs (High Rock slang for prison guards) step out of the bushes. Genghis is killed while Harry is hauled back to the space jail for execution. Script robot Gerry Finley-Day seems to have created a thrill that deliberately reacts against the relative cosiness of popular BBC sit-com Porridge and avoids the grimmer clichés of prison life (2000 AD is still a comic for boys, after all). However, it’s Davis’ art which makes it a success. His work here is dynamic and full of movement. Davis doesn’t use a template to draw the guards or the prisoners; instead everyone has their own personalities and distinctive features. It means that when the “slugs” are vicious towards the prisoners, or the inmates are cruel to each other, the act has a greater potency. Basically, I’m emotionally engaged in this thrill and Alan Davis has to take some of the responsibility for it. Although not a regular reader of 2000 AD at this point, my purchasing of it was increasing gradually from once every few months to once every few weeks. I certainly picked up a copy of this prog due to, perhaps, the free gift. 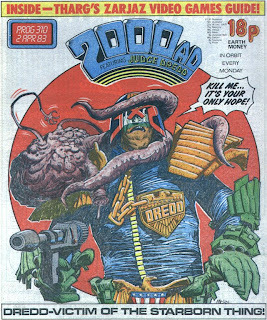 To celebrate three hundred issues, Tharg gave us is a replica Judge Dredd badge. My memory of the badge is that it was pretty good and looked exactly like the one Dredd wears himself in the thrill. Attaching it was a touch problematic as it came with just a not-very-sticky patch for affixing but Tharg advises in the Nerve Centre taping a safety pin to the back instead. Being the eldest of six children, there were plenty of safety pins in the house (they were used to hold nappies in place). I had a jacket that I wore to school often and the badge was fixed to that. 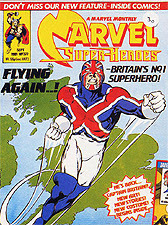 Other comic free gifts that I remember loving were the Captain Britain mask from the first issue, which lasted about two days before tearing during a game of superheroes, the Hook Jaw T-shirt transfer that was in issue two of Action and lasted until I outgrew the top it had been ironed onto, and the bionic fake tattoos that came in 2000 AD prog 2. I went into school with them on and tried to convince all my friends that I had a robot arm. I think they might have believed me had the tattoos not cracked since I had rubbed them on the day before. Despite being non committal about the Judge Dredd strip at the time, I liked the badge a lot. I wasn’t quite like Linus with his blanket in Peanuts but I felt slightly more assured when I wore that jacket with it on. Then, one morning, I went to put the jacket on and I noticed that there was only a safety pin with a browning piece of seletape attached where the badge once was. Tharg’s Future Shocks have been absent for a while but in its place is the new Time Twisters. These are short, sharp, shock thrills in the style of the Future Shock except they have a principle theme of time travel. Thanks, perhaps, to the collections from Titan and, more recently, Rebellion, I always thought that the Time Twisters were a creation of Alan Moore but this doesn’t seem to be the case as, so far, they’ve all been written by someone else. This prog’s, called Family Trees, is about a genealogy company which use time travel technology to track down a famous ancestor for you. This is much more convenient than traipsing around old reference libraries and talking to old people. In fact, Amalgamated Ancestors are so confident that everyone has a famous ancestor that they offer to pay anyone for whom they fail to find one for one billion megabucks. As the company head explains, everyone has two parents, four grandparents, eight great grand parents and so on, so the likelihood of us all having a famous ancestor is pretty high. It’s good to see script robot Alan Hebden back. Although I had some difficulty with Meltdown Man occasionally, I did enjoy Psi Wars which he wrote for Star Lord, so it’s cool to see him still scripting modest little gems like this. 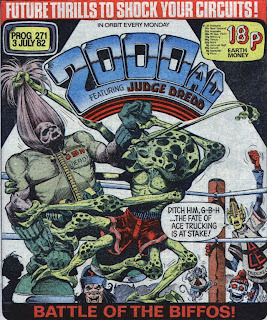 As for John Higgins, he’s not an art robot that I associate with 2000 AD for another two hundred progs. Amazingly, his work at this stage is fully formed and looks exactly as it does when he goes on to become more established. ANNOUNCEMENT: For those of you who find reading The Slog as often as I post it a bit of a er…. Slog, then you might like to know that the edited high lights/omnibus version has started to appear at new comics’ website, http://www.comicsvillage.com/. The first column is available to read now, the second Sunday 25th November and then every fortnight after that. Sometimes, when putting together this blog, I find myself getting confused about what tense I am writing in. Am I writing in the past tense because these were published twenty-five years ago, or the present tense because they are real to me now? I re-read what I’ve written before posting it and I trip over myself correcting it all. In the Judge Dredd story, The Executioner, which finished recently, a vigilante is committing acts of revenge against members of Mega City One’s criminal underworld. 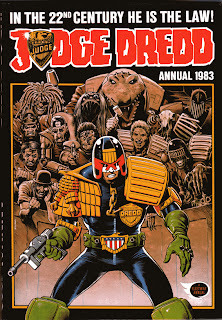 The Judges know that The Executioner is a blond woman but Dredd also suspects that she is a Judge. So, he embarks on a series of interrogations of blond, female judges in an attempt to flush her out. I found myself thinking, surely the judges can do some sort of DNA check to help them narrow down the search if they know this much already. This is supposed to be set in the future after all, forgetting, obviously, that this story was first published in 1982. In this prog’s tale, Bizmo Klux is mugged and thrown into a rad pit afterwards. Because he is 134 years old and had so much replacement surgery over the years, what’s left of him rises out of the hole in search of revenge and flesh. Bizmo was born in 1971, which puts him at about my age and forces a connection between me, the reader, and the character. That could be me, one day, living through Chief Judge Cal’s mad reign and The Apocalypse War before getting jumped by a tap gang and being left for dead in some radioactive sludge. I suspect for this story that script robots John Wagner and Alan Grant chose Bizmo's year of birth deliberately. I wonder if, in 1982, 1971 was the year that the average reader was born in. There’s a bit of a games theme going on this prog. Loyal Squaxx De Thargo can win an Intellivsion Master Component while Ro-Jaws reviews Tron (this is what the garbage droid has to resort to now that there are no new Ro-Busters thrills being made; film reviews). Apparently, “a feast for the optic circuits”. Also, in addition to starring in two new books from Titan (man, they’re banging out those collections now), Judge Dredd now has his own board game from Games Workshop, according to ads. Although at this point in time I wasn’t reading 2000 AD and owned only a tiny pile of back progs, I somehow ended up with a copy of the Judge Dredd board game. I don’t remember how this came about as I’ve never been into role playing, computer or board games. The problem with games is that they require someone to read the instructions and, if you are the owner, then it was your responsibly to do this. 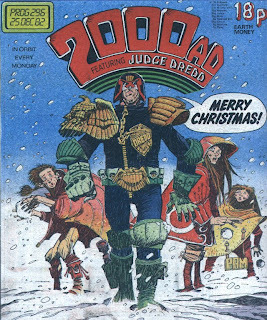 I do remember, however, loving the package, from the Brian Bolland drawn box to the Ian Gibson designed board. I remember just pouring through the action cards which referenced episodes of Judge Dredd that I had never seen and thinking how cool all of those stories looked. If only I had stuck with the comic after I had bought prog one in 1977, things would be so different. I definitely did play the game once, though. A couple of years later, my family had gone away on holiday for the week and I had the house to myself. Somehow, two very attractive girls I knew, one of which I had a significant crush on, came over one evening. I was pretty useless and unprepared, for example I’m certain I hadn’t got any booze in, and all I could think to do was to play the Judge Dredd board game with them. I think I thought I was being ironic by suggesting it but, of course, I went on to win. What an idiot; I didn’t even suggest that we play strip Judge Dredd the Board Game. I remember thinking later that they didn’t stay for nearly as long as I expected them to. So, in summary; Judge Dredd the Board Game equals regret. Sam Slade; Robo-Hunter is back after a short break! Hooray! Prime Droid, Iron Aggie, has declared it national song day or something so that this story is principally sung. This is decades before that classic episode of Buffy The Vampire Slayer everyone goes on about that I’ve never seen. The high rate or output from script robots John Wagner and Alan Grant might result in unfortunate stereotypes every now and then, like the portrayal of Japanese football fans recently, but in general, it’s impressive just how strong the quality of their work is at this time. I would even describe it as awe inspiring. In fact, I think I will. It’s awe inspiring. I’m really enjoying 2000 AD at the moment. There’s rarely a dud to be seen, especially now that The Mean Arena has finished. Between them Wagner and Grant, with Gerry Finley-Day, are providing that consistency of tone I’ve talked about before, which is quite an achievement considering the quantity and quality of their output. Well done, everyone. 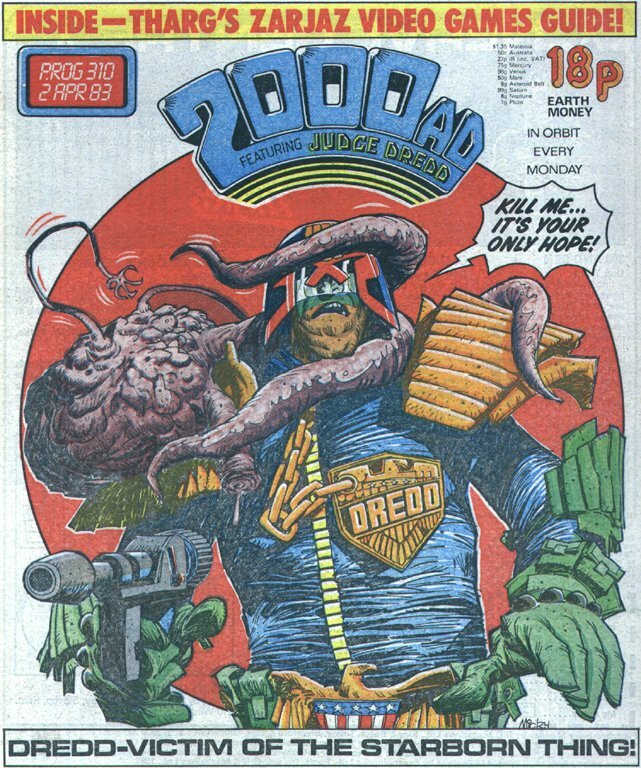 I’ve blogged before about how, as an occasional 2000 AD reader during the prog 200s, I considered it slow on the uptake on certain strong creators. As performing The Slog has revealed, contrary to what I had believed first time around, it was pretty quick when it came to hiring Steve Dillon after his work for Hulk Comic and, in the case of Alan Moore, it was there long before Warrior appeared on the scene. However, I think I was right to think that Tharg was sluggish when it came to offering Alan Davis a gig considering his first professional comic work had appeared just over a year before in Mighty World of Marvel 377. Prior to The Mighty World of Marvel 377, Captain Britain had been a character who, since his creation in 1977, had either been bandied about between Americans, functioned as a support character in the excellent home grown Black Knight or just been absent altogether. In 1981, he had at last been given his own strip drawn by UK resident Alan Davis. From the beginning, his work was excellent and, as the year progressed, it got even better. Given all of this, then why the delay in him becoming an art robot? Fortunately, the quality of Davis’ art won through in the end so that currently, he is on the fourth part of Harry Twenty on the High Rock for 2000 AD. So far, there hasn’t been a pair of thigh length boots to be seen. There are, however, hundreds of male prisoners who seem to be wearing judo suits which could fall open at slightest touch from a leather clad guard’s truncheon. In the early days, there was a high mortality rate in 2000 AD. If you were a new character, it was only a matter of time before you were shot in the face, pushed out of an airlock or tripped into a garbage grinder. By the prog 200s, defying death was becoming a theme. We’ve already met Judge Death twice (“how can you kill that which does not live?”) and Torquemada, in Nemesis the Warlock, who dies and is either reborn in a new body almost immediately or floats around wrath like, possessing others and causing all sorts of mayhem in their names. The important thing to note about these characters is that this death defiance is in their nature. Bringing back a character that had very obviously died, with no supernatural associations whatsoever isn’t something they did until the Judge Dredd story Destiny’s Angels, which finishes this prog. Killing comic characters and bringing them back to life is something that isn’t uncommon in mainstream superhero comics. During the nineties, Superman’s death in battle and economics driven return to life was so high profile that, when Jack Kirby died, it led to a poor joke on an American talk show about him also returning soon. In fact, it happens so often that Captain America readers are expecting Steve Rogers to return by the end of 2008 while you could almost hear the comic fan internet sites letting out a sigh of despondency on hearing the rumour that DC plan to kill off Bruce Wayne and replace him as Bat Man with one of his Robins. The return from the dead of Mean Machine in Destiny’s Angels isn’t a cynical attempt to increase sales to a shrinking audience, however, but an acknowledgement on the part of John Wagner and Alan Grant that they might have been premature preventing themselves from using a character as strong as this again by killing him off. Even when Judge Dredd shot Mean dead during The Judge Child Quest, it must have been hard for everyone to imagine this strip still running five years later, let alone twenty-five, despite the relative popularity of it at the time. 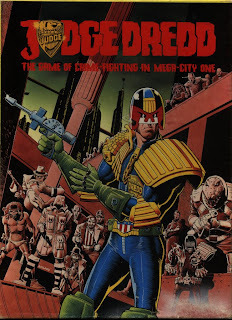 By this prog, people are beginning to comprehend that perhaps Judge Dredd had a few more years left in it and dispensing of strong characters in a cavalier manner might not be the wisest thing to do. No matter how improved the 2000 AD Annual might be, the Judge Dredd one keeps several steps ahead. 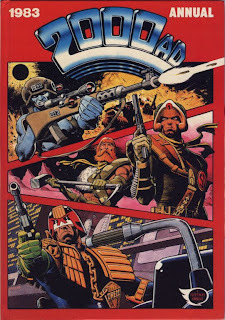 Even this year, with the interior colour art now being provided by Carlos Ezquerra instead of Mike McMahon, it would still win in The Battle of the Annuals competition if such a thing had actually existed. Ezquerra is amazing if you think that this year alone he has drawn the entire Apocalypse War story in addition to several fall-out tales and associated covers for the weekly. When did he find the time to draw and colour another twenty-five pages or so for the annual? In truth, I’ve seen his colour work from before this time, and it is better than this, but the quality remains strong and the achievement still stands. I’ve been watching episodes of Seinfeld on DVD recently (I don’t just expose myself to old stuff, by the way). The creative team of Jerry Seinfeld and Larry David, the deadlines that they faced and the environment in which they worked, makes me think very much of John Wagner and Alan Grant and their situation. This year, they write all the strips between them so that there isn’t just a consistency of look provided by Ezquerra but also of attitude. Having a tighter, leaner creative team is something that has, so far, helped to make the Judge Dredd Annuals so memorable. McMahon isn’t entirely absent as there are some old Dredd strips drawn by him here. Seeing his artwork reprinted on better quality paper helps to emphasis just how good it is. Although, the shape of the annual is different to the shape of the original artwork, so much of it might not be McMahon’s anyway. After years of disappointment, the annuals have now settled into a higher quality groove. Just take a look at that cover for starters. Having it drawn by an artist that we recognise from the weekly, Brian Bolland, instead of some painty-guy unfamiliar with the characters makes all the difference. The contents are pretty good as well. There are some nice stand alone strips featuring characters that are more in line with what is happening in the weekly right now. Overall, a pretty good stocking filler for Christmas morning, I imagine. Alan Moore gets to write two of the strips, Ro-Busters and Rogue Trooper. At this point in time, Moore is really trying to give us value for money, packing the panels with lots of words. 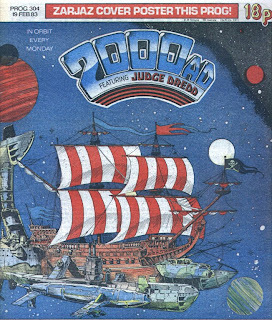 It’s an interesting contrast to the Alan Grant penned (using the pseudonym Staccato) Strontium Dog and Judge Dredd stories which are light to read but entertaining just the same. Pat Mills scripts the origin of Blitzspear, Nemesis the Warlock’s ship, delightfully illustrated by Kevin O’Neill. My only problem with it is that, thanks perhaps to the binding, one of the double paged spreads is the type that you don’t realise is a double paged spreads until you get to the last panel. You can re-read it as it’s meant to be but what’s the point now? The impact of those pages is lost. What on earth are Alan Grant and John Wagner thinking? 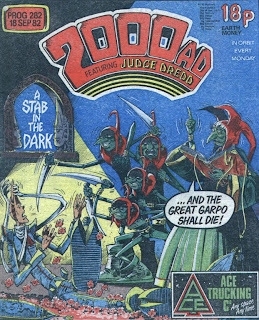 The writing partnership that set the tone for 2000 AD during the eighties and established it as an effective satirical publication in addition to it continuing to be a great comic for boys, resorting to this. Portraying Japanese people as buck toothed, slant-eyed idiots. In this episode of Robo-Hunter, Football Crazy, the supporters of Japan are all drawn by art robot Ian Gibson as four foot tall and looking exactly alike. I can only assume that Gibson was instructed to draw them like this in the script as Grant and Wagner have members of the crowd shouting things like ”cliet pleeze!” (please be quiet), “that a rie!” (that is a lie) and “me no confesee!” (I won’t confess). While interrogating a member of the crowd, Kidd slaps him and says, “shut it, nip!” and, after he smashes a camera to pieces, the supporters riot chanting “Blakee Pentax!” The creator droids can’t even hide behind the excuse that the Japanese supporters are shallow robots as they are meant to be living, breathing human beings. The only explanation I can think of for this aberration is that it is 1982 and Alan Grant and John Wagner, thanks to their workload, didn’t give expressing national anxieties about Japan’s economic influence on the UK at the time proper thought. Whatever the explanation, I’m going to pretend that this episode didn’t happen. Next prog: England face Italy in the semi-finals. Ay yi yi. I did it again. No sooner do I admit to no longer disliking a thrill that it finishes. This prog sees the last episode of The Mean Area. If I had known that this is all it takes then I would have pretended to have come around to it long ago. The finish felt a little abrupt, as if Tharg had suddenly decided that everyone involved had given it a good go but enough is enough. Previously, it had taken Tallon weeks of episodes to track down a single member of The Hexa-Gang, the group responsible for his brother’s death, but this time he got the last two in just a couple. Embarrassingly for me, one of them is Kevin O’Conner, the sports commentator who had taken the killing of Mother Vlad off air so that the reputation of Street Soccer would remain intact. It turns out that what I thought of as an act of honour was actually more selfishly motivated. Either that, or script robot A Ridgway received the order to terminate the strip more recently than I first thought. As it turns out, all O’Conner had done to contribute to Paul Tallon’s death was to start a rumour that he was a coward resulting in him playing a riskier game. It seems a bit much to me for Matt Tallon to decide that this makes him partially responsible for his brother’s death. After all, isn’t this the sort of thing that tabloid newspapers do all the time in the real world? Would you blame the editor of The Sun for the death of Heather Mills if she had acted on her suicidal thoughts, for example? It’s a cruel world out there, Tallon. Just because your brother lost his leg in an accident and has donated eighty percent of his income to charity doesn’t mean that he isn’t a fair target for untruths and innuendo. After all, he did used to be a glamour model and marry the nation’s favourite surviving Beatle after Ringo Star. He probably deserved it. 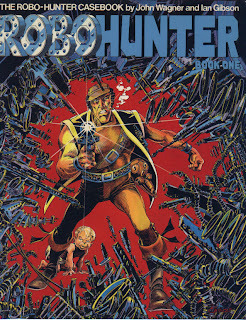 The final part of Robo-Hunter story The Killing of Kidd appears this prog. It turns out that the person trying to kill Kidd, the nappy wearing 39 year old soap opera star, is everyone. Even his own mother is among them but can you blame her? After all, Kidd did have her head transplanted onto a monkey's body. On the surface, this seems like a cruel thing to do but, come on, who wouldn’t stitch their mother's living head onto a monkey's body if they had the opportunity? Now, if it had been onto a penguin's body, then that would have been weird. 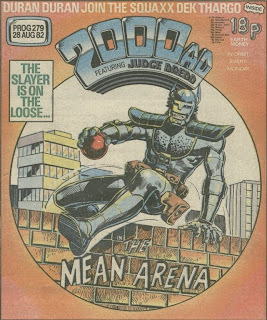 Recent adverts for the Titan Book collections of 2000 AD material show that they have branched out from Judge Dredd to include Sam Slade's first adventure. 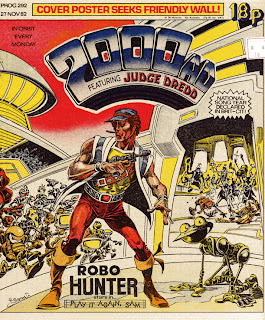 Given that they could have chosen almost any other thrill to reprint, including Strontium Dog, Ro-Busters or ABC Warriors, I wonder what encouraged them to decide on Robo-Hunter. Whatever the reason, I love the current run of shorter, Brit-Cit based stories, probably because this is the first time I'm reading them. They are bright, fun and imaginative. It's a shame that more comic strips aren't made this way, these days. ITEM: I feel I did a disservice to John Casanovas when I described the art robots on this year’s Sci-fi Special as “fill ins”. Casanovas drew the Judge Dredd story for it as he does for this prog. He has an intricate but accessible style. Everyone is drawn with small but bulbous and shiny noses, as if they’ve been taking secret gulps of gin between panels. 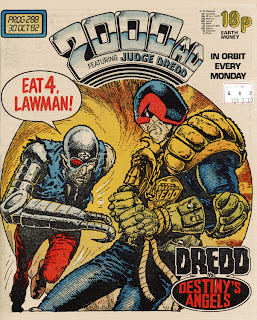 I particularly like the way he draws Dredd. Most artists are now opting to draw him with a Bolland styled scowl but Casanovas gives him a dignified sternness. Definitely the quirkiest artist to draw Dredd so far, which is saying something when you consider how much McMahon has drawn by this point. ITEM: I never thought that this would happen even though it did with previous thrills that I started out not liking, but I’m beginning to quite enjoy The Mean Arena. Seeing commentator, Kevin O’Conner, refusing to broadcast the Vampire Team’s attack on their manager to prevent the sport being thrown into disrepute struck a chord with me. It was as if Street Football has suddenly become a metaphor for life and seeing O’Conner act nobly must have connected with me with me somehow. Seeing Matt Talon announce at the end of this episode that there are only two more people left for him to avenge his brother’s death on, inferring that there is probably a light at the end of this thrill’s tunnel, is another factor. With any luck, he’ll do it quickly and take them both out at once. However, it’s Mike White’s art that remains the main pull for me. I really like it. ITEM: In this prog’s episode of ACE Trucking Co, Ace announces to Ghost, the ship’s computer, that he and GBH are leaving for some “horizontal”. It turns out that we don’t get to see the start of 2000 AD’s first gay relationship; “horizontal” is space trucker speak for ‘a sleep’. Before closing his eyes, Ace sticks a tube into his mouth and instructs Ghost to administer a double dose of Mac Mac to him every hour. I like a drink as much as the next man but if you have to have one to get to sleep then that’s something you should be worried about. If you need a drink every hour to stay asleep then you should almost certainly visit your doctor. This prog’s notable first occurs at the end of this episode; Ace gets his point chopped off. In this prog’s episode of Rogue Trooper, it is confirmed that crazy ol’ Bagman was right all along and Sister Sledge is a dirty Nort spy after all. That’s women for ya! You think she fancies you and the next thing you learn is that she’s been injecting you with viruses in your sleep that she’s been inventing behind your back. Call me an old romantic if you like, but the idea of love blooming in the war torn, over irradiated landscape of Nu Earth appealed to me so much that I was even willing to over look the time Sister Sledge poisoned an entire platoon of young, South soldiers. Okay, we didn’t actually see her do it, but we, Rogue and me, should have taken Bagman’s word for it, even if he has been acting a bit strange recently. I thought that the reason Bagman, Helm and Gunner didn’t like her is because, how can I put this delicately; they are jealous due to, since “the accident” and getting bio-chipped, not being able (whispers) to get it up anymore. I’m beginning to see Rogue as like a father to Bagman, Gunner and Helm; their loss of senses rendering their perception of the grotesque environment that is Nu Earth child like resulting in them being completely dependant on him. No wonder they were resistant to the idea of a woman in his life or a step mum in theirs. I get a sense when reading Rogue Trooper at the moment that script robot Gerry Finley-Day is straining against the boundaries. That there is, contained within this unsentimental war strip for boys where the bad guys are the bad guys for no reason other than they just are, something substantial waiting to break out. Sometimes, I enjoy The Slog so much that I forget that the comics I’m reading were originally published twenty five years ago. On these occasions, a cultural reference might occur that can bring me out of the moment with a bit of a jolt. For example, in this prog, I learn in Robo-Hunter that Brit Cit’s most popular soap opera is Space Family Ogden while in The Mean Arena, The Slayers have a player called George Roper. 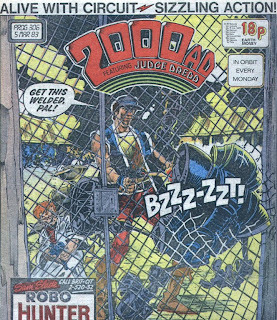 The Ogdens and George Roper seem like house names from so long ago, so how can these 2000 AD stories feel so recent to me? It’s moments like this that remind me of how much of The Slog stretches out before me. I was looking forward to announcing with this entry that I had reached the quarter way point but a sort out at home yesterday revealed that The Slog is due to finish with prog 1188 and not 1100 as I had originally stated. 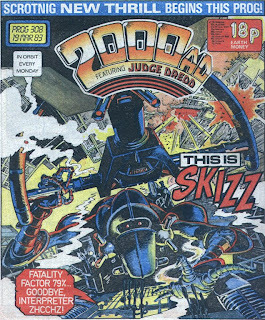 I wouldn’t mind so much if those extra eighty eight issues came from the age of 2000 AD that I am currently at but the thought of having to read an additional eighteen months worth from the late nineties makes me feel a bit depressed. I’ve also been wondering recently if I should include The Megazine as part of The Slog. I still have volume one from when it was first published and thought I would re-read that but should I also include volumes two and three? After all, they were published during the period of time that The Slog is supposed to cover. My problem is that memory tells me that these aren’t particularly good issues over all and the prospect of adding an extra one hundred plus below par comics to the project fills me with woe. 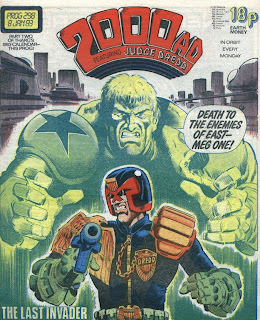 My dilemma is, because I read Star Lord, due to it contributing significantly to the culture of 2000 AD, and all associated annuals, then logic must dictate that I should also include The Megazine. What do you think? Trouble on Tree-World, by Steve Moore (no relation) and Alan Langford, sees the return of Agent Rat. Who, you might ask. Exactly, I reply. According to Tharg, Agent Rat last appeared in prog 213. I don’t remember that at all and I only read it last September. I thought that when doing The Slog I would have encountered a repetition of story from Wagner and Grant long before a repetition of name but there it is, as plane as the nose on Jimmy Nail’s face; Dave Paton. As long time readers of The Slog will remember, Dave Paton was the owner of Elvis, the robot car that went on a killing spree in prog 56. In this prog, Dave Paton is one of the six Bampot scientists that Ace takes on board the Speedo Ghost. You probably think that, even given the contracted period of time in which I am reading all of these comics in, remembering the names of bit characters is an achievement especially after forgetting a more significant player like Agent Rat so soon. The truth is, however, that I used to work with a Dave Paton (hi Dave, if you’re reading this), so it’s no achievement at all. Belardinnelli doesn’t draw himself in every strip he’s credited with but he does it often enough for it to be a signature move. In ACE Trucking Co he’s drawn himself as Professor Max Challenger, another of the Bampot scientists. I’ll recognise that thick beard and the hair parted by Moses anywhere. Also drawn as Bampots are Alan Grant, as Doctor Hoskins, and John Wagner, as Chumley. I presume that the other scientists, including Dave Paton, are also based on real people but I couldn’t tell you who. I wish I did as Miss Frobisher and Celia Fforbes-Schmidt look cute to me even with their lack of torsos and underdeveloped limbs. I’m back online and feeling fine! And, to top it all, prog 270 arrived in the post today! The Slog is back on track, baby! It’s the second ACE Trucking Co cover in a row. I didn’t realise that this thrill was so highly regarded. GBH is taking part in The Battle of the Biffos, a knock out wrestling competition, because Ace is desperate to win back his two lugs that he lost to arch rival, Jago Kain, in a previous episode. Kain agrees to the bet but only because his new biffo, The Brute, is some kind of super sized giant or something. In fact, The Brute is so intimidating that his opponents are knocking themselves out before he even gets to raise a finger. Over in Judge Dredd, the war has been won, McGruder is now Chief Judge and all able bodied citizens have been conscripted into rebuilding the city. Dredd has been sent to sort out a robo-rebelian. Ownerless robots have built a Meka City under the leadership of Precious Leglock, a jewel encrusted wrestling droid. It’s July 1982, there’s definitely a wrestling theme going on in this prog and I’m trying to remember how popular the sport is at this time. It’s too early for American wrestling to have made any sort of impact over here, although Precious Leglock does rant like a WWE star. British wrestling, which was definitely huge at the end of the seventies, I thought was on the wane at this point. Whatever, it is still alive in the hearts of Wagner and Grant and that’s fine by me. Incidentally, what is a “biffo”, anyway? Due to practical and technical difficulties beyond my control, I can't update The Slog as often as I would like to at the moment. 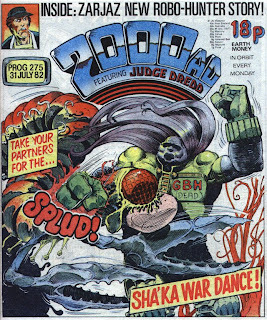 The practical difficulty is that when I reached over to my 2000 AD pile to read prog 270 last week I found it was missing. Something like this has happened a few times during The Slog but I'm slightly irked at myself for letting it get to this point this time because when I reached the two hundreds I did a deliberate prog count to confirm that they were all there. The good news is that I was able to order a copy from eBay straight away, the bad news is that it hasn't arrived yet (defeating one of the points of the "buy it now" option I would have thought). Hopefully it will arrive over the next day or two. Technically, my broadband connection has been running like a dog since August (ISP Talk Talk) and has now ground to a halt (I'm posting this on the sly from work). Fortunately, I now have a single point of contact at my ISP and their finest brains are working on the problem (although I would say that I have had to make days worth of truly depressing calls to reach this point) whatever it is. Hopefully I will be back up and blogging in a day or two but if you don't hear from me for a while then you know why.